This whisky is called ”Happy Hunting”. Some fruity notes with hints of leather and tobacco in the smell. I almost feel like I am standing in a pine forest! The taste is very oaky with hints of vanilla and tobacco. The finish is almost just a continuation of the taste. Medium length and the flavors just fades away nice and easy. 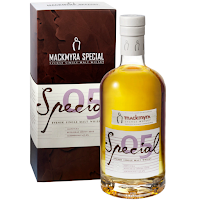 Probably my favorite of the Mackmyra’s I have tried from the “Special” series. I really like the tobacco notes all the way from smell to finish. I will give this 85/100 (21/22/21/21).